Formula One’s young driver testing ended today with the familiar sight of an Australian topping the time-sheets in a Red Bull as Daniel Ricciardo signalled his intention to follow in Mark Webber’s footsteps. The 20-year-old from Perth, who is the reigning British F3 champion, saw his day end early after 77 laps when his engine gave way, but still managed to set by far the fastest time of the three days – a full 1.3sec ahead of Gary Paffett’s fastest run yesterday. At the other end of the scale, the best of Ho-Pin Tung’s four laps for Renault was 15 seconds slower than the Australian’s 1min 17.418sec – but the team said this was because they had sent him out in the rain for a few minutes so he could sample wet-weather F1 driving. Paffett and Paul di Resta were again up among the leaders for McLaren and Force India, with the latter a tenth faster in second overall on a day when his team struggled with reliability and other interruptions. Di Resta suffered a minor off during his laps, while America’s JR Hildebrand lost his fastest lap to a red flag and was also affected by his car’s engine-saving mode kicking in unexpectedly. Nico Hulkenberg was unable to maintain Williams’ record of finishing in the top four each day, slipping to fifth behind Mike Conway for Brawn. The highly-rated German, who will debut with the team next year, was unable to beat F2 champion Andy Soucek’s time in the same car on day one. Conway, by contrast, finally put some clean air between himself and fellow Brawn tester Marcus Ericsson who managed only eighth behind Bertrand Baguette for Sauber and Oliver Turvey for McLaren, who had been third-fastest in the morning session. Lucas di Grassi was ninth for Renault, ahead of Hildebrand, and then came the trio of drivers who shared duties for Ferrari as their prize for their performance in Italian F3. Pablo Sanchez Lopez took the honours ahead of Daniel Zampieri and Marco Zipoli. Finally, ahead only of the tentatively aquaplaning Tung, came the Toro Rosso pair of Brendon Hartley and Mirko Bortolotti. 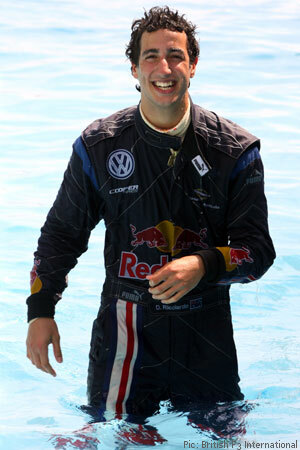 New Zealander Hartley is Australian Ricciardo’s flat-mate while they have been racing in the UK – and will also be his team-mate in World Series by Renault in 2010. He’ll be hoping to be a little closer to his Antipodean rival next year than he was today. Categorised under F1, tagged under Daniel Ricciardo, F1 testing, Formula One, Gary Paffett, Mike Conway, Oliver Turvey, Paul di Resta.